We came across something that may allow your ordinary party photos to shine again. Enter PixMangler (see it here), alternative photo editor. This little thing creates a variety of industrial, cybergoth or grunge effects. It works best with indoors photos. We had a lot of fun playing with it and we are sure you will love it. There is a couple of presets that can be used to instantly transform your photos into grungy and dark looking images that are very suitable for our scene. 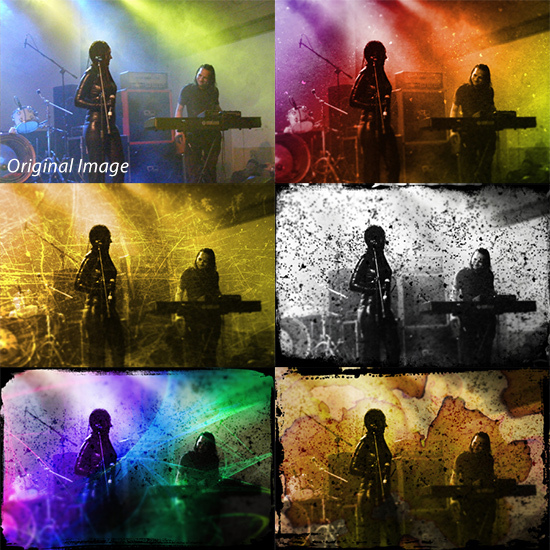 Have a quick look to see how it works – below you can see the filters in action, original image is the top left one. As you can see Pixmangler can transform your photos completely without any effort. All parameters are editable so you can create your own effects or adjust existing filters to your taste – possibilities are endless. The example photo shows our friends from the band called Alienoil performing during Castle Party Festival.